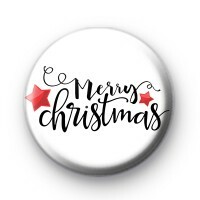 Black and White 25mm Merry Christmas Badge with festive red stars. Are you trying to spread a little Christmas Joy this year why not pin our festive themed badge to your coat & Wish Everyone a Merry Christmas. This is also a lovely badge to give out at your Christmas Party or add them to your Christmas Gift Tags.